If Grand Island is the head, and Munising‘s deep water harbor is the neck, then Munising itself is a rough-hewn, semi-precious necklace on a leathery cord. From wherever you might be along its grid of tree-named streets, your eye is drawn beyond the pretty face of its anchorage to the Big Water beyond. Nestled against what some say is the most perfect harbor along all of Lake Superior‘s shoreline, Munising is anything but flashy. Tough and self-sufficient, challenged by weather and an economy that bears no quarter, it’s quirky and homespun. Ripe for discovery. Munising is certainly not cute, but it’s charming all the same. The rich heritage in this area dates back around 5,000 years, with archaeological finds on Grand Island and the East Bay. From the prehistoric people to the European explorers, to the days of high commerce and travel along the Big Lake, Munising’s harbor was a natural, welcoming shelter. Today, it’s an escape for those who come to stay a week, or those who come to stay forever. We came to see the Pictured Rocks National Lakeshore – miles of rock formations that appear to have been celestially painted, some rising more than 200 feet from the water’s surface. They can only be seen by water, and the cruise is breathtaking. The major formations have names and stories: Miner’s Castle, Caves of the Bloody Chiefs, Indian Head, Battleship Rock. Each is more spectacular than the last. We were spellbound with the imagery our minds created as we passed and the depth of the imaginary scenes was magnificent. The changing vistas were marvelous. All this was the result of mineral-laden water pouring into Lake Superior during the annual melts. See our Gallery for more of Peter’s photos. We were awestruck by what can only be described as the handiwork of God. Munising’s laidback pleasantness was so comfortable that we found ourselves scheming to borrow more time. We took in an art festival, there was music scheduled in the park, plans for a benefit run, Friday fish fry, pasties to enjoy, and above all, friendly Yoopers made sure we had the best time possible. We scored the best campsite at the municipal campground (906-387-3145) — right on the beach, with a great view of the islands, Grand and small. It was the perfect spot for a sunset bonfire, which was a special opportunity to reconnect with a long-lost cousin whose summer cabin was in the area. A thunderstorm and big lightning show blew in after we called it a night, yet all was calm the next morning as we awakened to the sound of the waves. We ate up “scrumshuss vittles” and animated service at Dogpatch (906-387-9948) and enjoyed home cookin’ at Sidney’s (906-387-4067) a couple of great local watering-holes. We loved the Falling Rock Cafe and Bookstore, which has wi-fi should you need it. We visited the Alger County Heritage Center (906-387-4308), and were enthralled with an enormous World War II era scrapbook, lovingly rendered by a hometown girl while her brothers and friends were off to war. Were we to stay longer, we’d check out more of the Hiawatha National Forest (the visitor center is right in town), and add more waterfalls to our list of things to see (Munising has several within the city limits). Every time we go somewhere I tend to fall in love with where we are, and imagine myself living there. Usually, I snap out of this tendency within a few days of returning home. Not this time. Chalk it up to the Michigan girl who’d been away for too long, or perhaps it was the splendid natural beauty, or the realization that the south shore of Lake Superior has the sandy beaches, or it definitely could have been that Yooper friendliness. 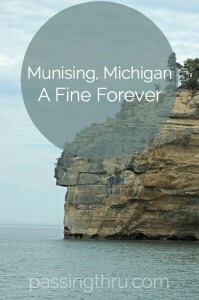 Whatever it was, I’m still thinking that Munising would make for a fine, forever stay. Loved your description of my beloved home town of Munising. Glad you enjoyed it so much. Thanks, Teri! We really had a wonderful and not long enough time! Thank you, Dennis! We will definitely take you up on the offer!